A day after Samsung issued two statements declaring that it was "adjusting production" of the troubled Galaxy Note 7 to respond to complaints and fires, the company announced on Tuesday that it has "consequently decided to stop production" —but the consequences of the entire debacle may extend for some time. "We recently readjusted the production volume for thorough investigation and quality control, but putting consumer safety as top priority, we have reached a final decision to halt production of Galaxy Note 7s," Samsung said in a statement on Wednesday. "For the benefit of consumers' safety, we stopped sales and exchanges of the Galaxy Note 7 and have consequently decided to stop production." AppleInsider spoke with several AT&T corporate-owned store managers, who are generally furious about how the situation has been handled by Samsung. "Those Samsung guys? They're not here," said one store manager. "We're getting the brunt of this, telling people that they can't get a Note 7, and before that, that we didn't have anything to give them in exchange. I can't even tell you how many people have yelled at me because the Note 7 was garbage." Estimates of Samsung's lost profits from the Note 7 issue and the generally poor handling of it have grown significantly over the last month. Initial estimates pegged losses of $5 billion over the product's life cycle. However, as news of the complete production stop of the Galaxy Note 7 spread, analysts started singing a different tune. Credit Suisse, the original author of the $5 billion figure, now claims that the complete loss will be $19 billion including recall expenses, assuming lost sales of up to 22 million phones. According to Reuters, two lawsuits over the botched design and consequent fires have already been filed in the U.S. While media coverage of the issue doesn't seem as prevalent as negative press reports surrounding the lack of a headphone jack on the iPhone 7 family, a greater problem may be damage to Samsung's reputation and overall brand impact. "The people this weekend? They were pissed that we could only offer them a [Samsung] phone in exchange until recently," said one AT&T store manager. "The floodgates opened when corporate said that they'd just take the [Note 7] back." Among the AT&T stores we spoke to, there have been 104 exchanges of the Note 7 in total, with 82 happening since the company loosened up its return policy for the device, allowing for other brands to be exchanged for the problematic phone. Most have switched to the iPhone, with 72 people opting for an iPhone 7 or iPhone 7 Plus in the last few days. "This has probably killed the Note 7 brand name," said managing director of Charter Equity Research Edward Snyder. "By the time they fix the problem they have to go through recertification and requalification and by the time that happens, they're going up against the [Galaxy] S8 launch." 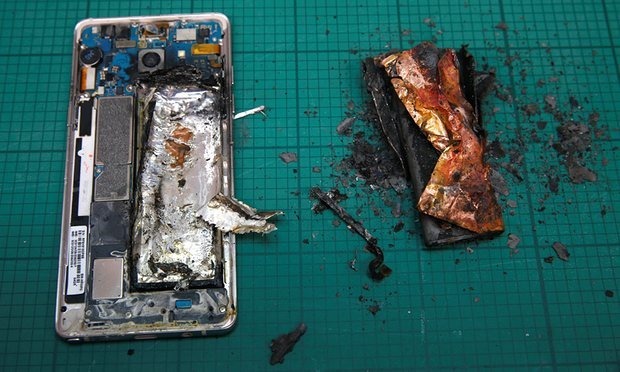 Samsung initially blamed un-named battery suppliers for the initial round of conflagrations. 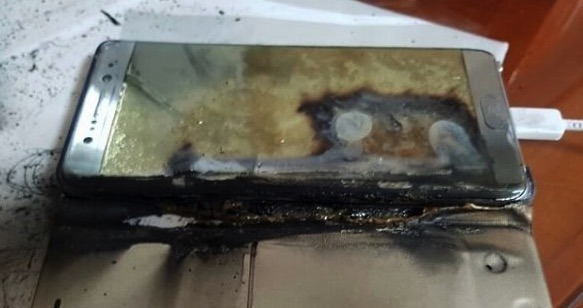 However, as reports of newly replaced Galaxy Note 7 phones bursting into flames started circulating, this time while the phones were powered off or not being charged, some doubt has been cast on Samsung's original account of the matter as well. Wednesday's statement is the most definitive and clear remark about the issue that Samsung has made yet, nearly nine weeks after the crisis began and six weeks after the "voluntary recall" was announced. Not clear is if Samsung intends to do anything about the confused communications about the issue still coming from a third party handling the return and refund process. "The [Galaxy Note 7] is forever going to be tarnished and the danger is that the brand becomes irretrievably damaged as well," said Stephen Robb, a partner at UK law firm Weightmans. "They need to be writing to every customer with an apology and some form of 'compensation'... It will clearly be costly for the company but the alternative is to end up going the way of Nokia and Blackberry."